Last edited by Wade; 10-19-2003 at 12:38 AM. Last edited by SupraFiend; 11-19-2002 at 01:50 PM. Last edited by lbto; 01-13-2003 at 02:24 AM. Scott, Near Cincinnati, OH 85 mkii 5mge car is all stock. p-type. Last edited by zank; 12-26-2007 at 03:01 PM. 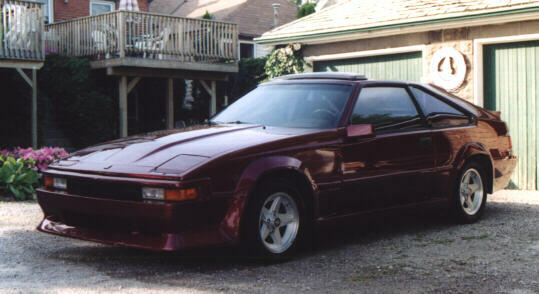 My 85 was a 6m na for one year then went turbo after I found an incrediable deal on an 88t. I kept the 6m-gte set up for about a year, but sold it to a friend - got tired of 16-19 mpg, 440's and S-AFC ran pig rich at idle and when afm was open apx. 30% the AFC thought it was open 100% and increased injector duty cycle thereby giving me crapy gas mileage. The 6m-gte made 290whp on a 96 deg. day at the dyno and 301whp a few weeks later when the temp was 62 deg at night. The 7m is just more flexable where tunning is concerened and I get much better gas mileage. matt ace. My car is fast as hell and it is now getting painted. Sup yall. I think this is my 1st post n e ways i ownez 2 mk2's. 85 blue auto stock 5mge. being built with tt and going into 79 MGB Rodster. 5-speed, rearend, and rear suspension also going in. Will post new website with pics soon. I got me an 1983 P Type... It really needs some work... the body has seen better days and a new paint job is REALLY needed... unfortunately poor college kids can't afford it yet... dammit!